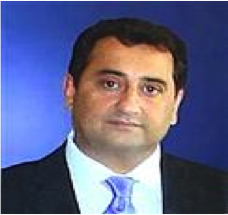 • Karim has worked in financial services for over 20 years and specialises in leading development of strategy, architecture and implementation of global programmes across dispersed teams in multiple time zones. • Held senior positions at Lloyds Banking Group, Fidelity International, UBS, Barclays and NatWest in a variety of senior architecture and programme management roles. • Successfully implemented global change programmes with the introduction of governance and continuous improvement initiatives. • Extensive experience across the financial services industry including investment management, investment banking, wealth management and retail sectors with comprehensive exposure to front, middle and back office functions. • Key experience of managing due diligence process for acquisition and merger activity coupled with defining integration approach and strategy. • Creation of the architecture and delivery strategy across multiple business areas for a major global retail banking organisation. • Wholesale reengineering of architecture to support a global asset management business to enable introduction of open architecture platform. • Global implementation of replacement systems for the front, middle and back offices for a Private Clients business. • Numerous projects for a large range of clients changing business processes and technology platforms in many functional areas including online channel delivery, trading, client reporting, performance measurement, fund accounting, regulatory reporting and financial accounting.